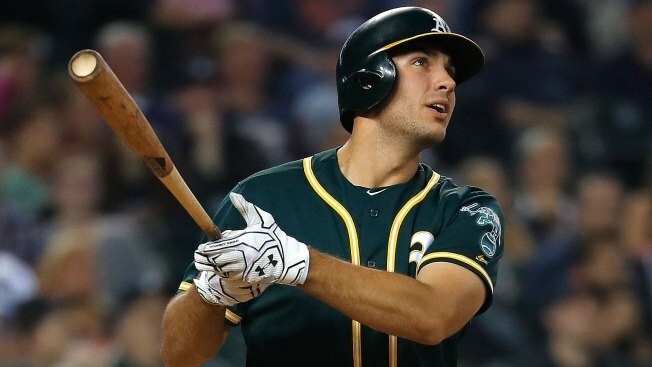 The beat goes on for Matt Olson, who set an Oakland rookie record Tuesday by homering for the fifth consecutive game. That makes it 23 in just 55 games this season for the A's first baseman, and an astonishing 15 homers in his past 21 games. In his first plate appearance Tuesday, Olson pounded a hanging 0-1 curve from Tigers lefty Chad Bell deep into the right field seats at Comerica Park. Since Aug. 11, Olson leads all of major league baseball with 19 homers. And his 23 homers are the most in franchise history over the first 66 games of a career. According to baseball statistician Doug Kern, just three others in Oakland history have ever gone deep five games in a row: Dave Kingman in 1986, Matt Stairs in 1998 and Frank Thomas in 2006.